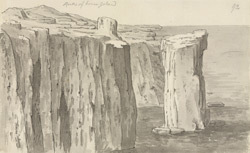 A view in ink of the rocks at House Island or Inner Farne Island, off the Northumberland coast. The Farnes consist of almost thirty islands, which are mostly visible at high tide. They were formed by the seaward outcrops of the Great Whin Sill volcanic intrusion, which can be traced from Upper Teesdale to the north Northumberland coast. This gives the Farne islands their distinctive blackened appearance. Inner Farne is the largest and most famous of the archipelago. For many years it was the home of the 7th-century monk and Bishop St Cuthbert, under whose administration the Lindisfarne Gospels were composed. Today, the Farne islands are an important nature reserve, home to many species of sea bird, including puffins, eiders, razorbills and cormorants. There is also a large colony of grey seals.